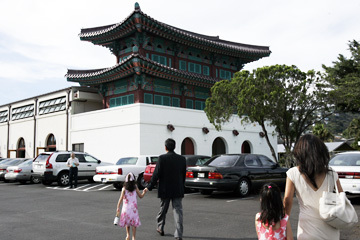 The 42-foot facade of Korean Christian Church in Liliha and the one-story sanctuary behind it were dedicated last weekend in the finale of a six-year, $3 million construction project. With its pagodalike structure on top, it is modeled after the 500-year-old Kyung Bok Palace in Seoul. Here, members of the congregation arrive for services. People are flowing through the "gate of the light of transformation" in Liliha again. The colorful entryway into the Korean Christian Church is a replica of Kwang Hwa Mun, the main tower gate into the ancient Korean royal palace in Seoul. The 42-foot facade and the one-story sanctuary behind it were dedicated last weekend in the finale of a six-year, $3 million construction project. The Rev. Peter Song, pastor of the 250-member congregation, said "a lot of members came into tears" when they reconvened for worship in the sanctuary after six years of meeting in the social hall. The pipe organ, silent since 2000, boomed forth and drew passers-by into the church, Song said. The church at 1832 Liliha St. was a landmark for 60 years -- not just because of the unique architecture. The independent Christian congregation was founded in 1918 by the late Syngman Rhee and other expatriate Koreans who fled their country after Japan forcibly annexed it in 1911. Hawaii was the center of Korean sovereignty activity, which succeeded after World War II. Rhee was elected first president of the Republic of Korea in 1948. Preservationists decried the demolition of the deteriorated old structure, which dated to 1938. Song said the new gateway is "an exact replica on one-sixth scale" of the 500-year-old Kwang Hwa Mun. "The old church was based on the memory of members; it looked rather more Chinese." The original at Kyung Bok Palace was the gate used by foreign ambassadors arriving for an audience with the king, he said. It was destroyed during the Korean War and has since been restored. The translation "gate of the light of transformation" had meaning because of its historical use, said Song. "We as Christians look at it in a different perspective, as people being transformed in the light of Christ." It had a special significance for Rhee, "who had the vision of Korea being transformed into a Christian country." The son of the late president, In Soo Rhee, and his wife attended the church dedication last Saturday. Song said the South Korean government donated $600,000 to the project, acknowledging the historic significance of the church's support in the independence movement. Christians in Korea contributed some money, but most was raised by the local congregation. There are still a few old-timers who were in the congregation when Rhee taught there before World War II. Rhee returned to Hawaii after being deposed in a 1960 student revolution, and died here in 1965. Song, a graduate of the University of California at Los Angeles and Fuller Theological Seminary, and former pastor of a 15,000-member church in Pusan, was chosen pastor in 2004. He will be joined next month by the Rev. Samuel Kim, who is completing a master's degree program at Fuller Seminary. Sunday worship services at the church are at 9 a.m. in English, 10:15 a.m. in Korean, and at 11:40 a.m. there is a bilingual service.